How a near pristine black-and-white reel of the entire television broadcast of the deciding game of the 1960 World Series — long believed to be lost forever — came to rest in the dry and cool wine cellar of Bing Crosby’s home near San Francisco is not a mystery to those who knew him. 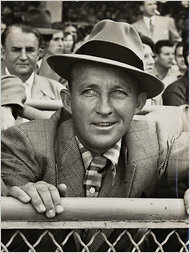 Bing Crosby, who was part owner of the Pittsburgh Pirates, hired a company to record Game 7 by kinescope, an early relative of the DVR. Crosby loved baseball, but as a part owner of the Pittsburgh Pirates he was too nervous to watch the Series against the Yankees, so he and his wife went to Paris, where they listened by radio. Television archives are lacking thousands of hours of classic broadcasts which were never preserved - they simply disappeared into the ether, never to be seen again. A complete recording of the very first Super Bowl broadcast, for example, does not exist, even though it was carried by two networks. For many baseball fans, a Holy Grail would be to re-watch the seventh game of the 1960 World Series between the Pittsburgh Pirates and New York Yankees, a contest dubbed by some "The Best Game Ever." Broadcast by NBC, there is no copy of the game other than a few newsreels that show highlights, including Bill Mazeroski's home run that won the game, and the championship, for the Pirates. Today The New York Times reported a remarkable discovery in the most unlikely place: A 16mm kinescope recording of the entire broadcast was found in the former wine cellar of singer Bing Crosby, where the reels have rested undisturbed for 50 years.